This large folding rule has flat legs, which bear numerous markings. It is provided with a graduated arc, but the sights are missing. 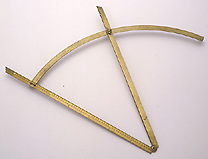 It could be used during navigation for angular measurements and the calculation of heights. The instrument originated in the bequest made by Sir Robert Dudley to the Grand Duke of Tuscany Ferdinando II de' Medici in 1649, and is undoubtedly of English construction.